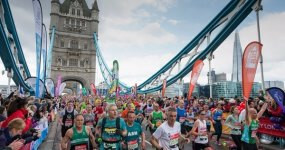 Darren, one of our directors here at Drayton Insurance, is donning his running shoes this weekend and taking on this years London Marathon! Darren has been training regularly to take on the 26.2 mile run around the Capital. Raising money for the East Anglian Air Ambulance, who provide emergency services across Norfolk, Suffolk, Bedfordshire & Cambridgeshire, he is very close to reaching his target of £2,500 and everyone here at Drayton Insurance are supporting him every step of the way!